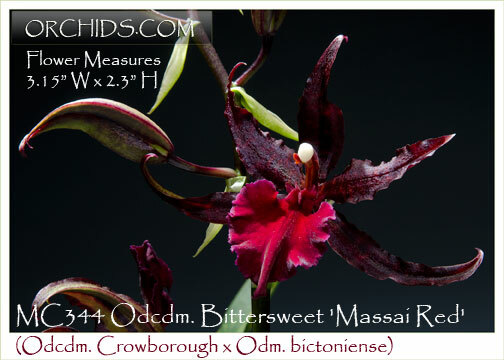 An exceptional red clone of this always popular and floriferous Odontocidium ! Most Odcdm. Bittersweet clones have flowered with mahogany blotches over a golden-yellow background – which makes this clone even more “Bittersweet” with its heavy suffusion of mahogany over the entire flower. Beautifully set off with a full bright red lip, this hybrid is capable of producing more than 30 flowers on each inflorescence. Its pod parent is also a parent of Colm. Wildcat with Onc. leucochilum in its breeding background. 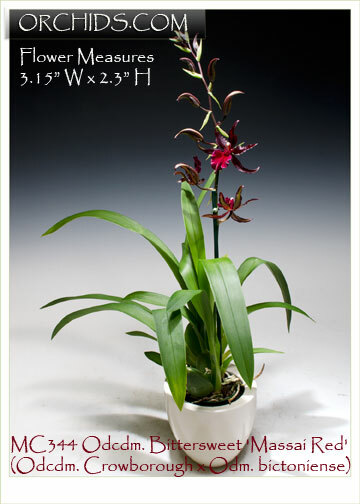 Growing from pleasingly compact rounded pseudobulbs like those of Odcdm. bictoniense, this particular hybrid is an extremely temperature tolerant intergeneric, happily growing outdoors with our Cymbidiums in Southern California. 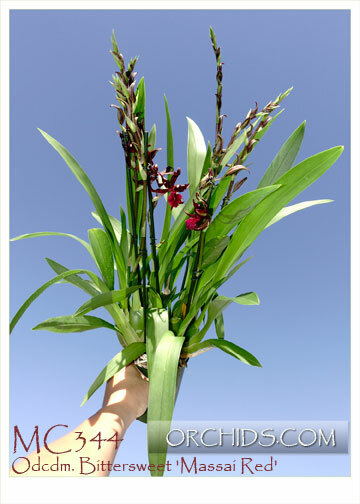 For a most amazing impact of multitudes of red flowers, this particular clone is Highly Recommended !